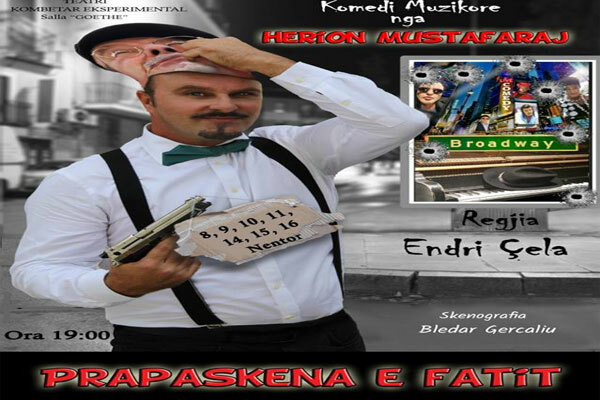 'Prapaskena e Fatit' A Musical Comedy of the One Man Show style. Herion Mustafaraj interprets himself. Directed by Endri Cela and Scenography of Bledar Gercalli this show is a production of Experimental National Theater K. Spahivogli. An early-stage pianist Uncle Fati, of Albanian origin, comes in the backstage of a Broadway Theater in New York to tune up the piano that is in the dressing room of a world-class artist. Uncle Fate enters the life of this artist through personal belongings in this room and reveals his hidden talent to the spectators. With the message "There is no need for a provocateur," he will awaken the sense of appreciation of human sacrifices in the difficult journey of emigration, respect for the figures of women, the elderly and the preservation of the culture and traditions in this new century. Between two different worlds of Albania and America, he finds the same social problems.